Via Laietana is the avenue that separates the Born and Gothic neighborhoods, at the same time it communicates de port with the center of the city arriving to the Urquinaona square. It was initially designed by Ildefons Cerdà in 1859 to link directly the new district of Eixample with the port, anyway it wasn’t until the 1908 that the project was launched. The demolition of over two thousand houses and some other medieval palaces led place to a gap of 80 meters wide and 900 meters long that would eventually turn into what we nowadays know as Via Laietana. Walking through Via Laietana from the Urquinaona square down to the port is an interesting itinerary that allows us to visit some of the most important buildings and monuments in Barcelona. If we start our itinerary from Urquinaona, Palau de la Musica will be our first stop while we walk down the avenue. This amazing building is a concert hall designed by Lluís Domenech i Montaner built between 1905 and 1908. You can easily tell that it follows the aesthetic of the typical Catalan modernist style. The building was restored, remodeled and extended between 1982 and 1989. Some years later on 1997 Palau de la Musica was declared a UNESCO World Heritage Site due to its architectonical value. Nowadays more than half a million people attend musical performances in this venue. If we continue down Via Laietana we will arrive to the well-known Santa Caterina Market. 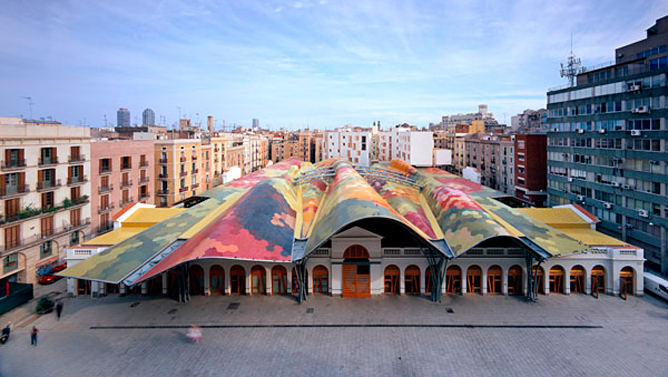 Located on the Born side of the avenue, just like Palau de la Musica, this historical market was restored by the architects Enric Miralles and Benedetta Tagliabue. This building is easily recognizable by its undulating and colorful roof, which gives to the market a great personality and originality. Furthermore, the Santa Caterina market has a big historical value as it represents the first covered market of Barcelona, built in 1845. The renovation responsible of its actual look was completed in 2005. The roof was designed to be viewed from the air, forming a mosaic of colors representing the fruits and vegetables that can be found inside. A perfect mix between Barcelona’s modernity and tradition. Very close to the market but on the opposite side of Via Laietana in the Gothic neighborhood we find Barcelona’s cathedral. This gothic and neogothic building was built between the thirteenth and fifteenth centuries over the old roman cathedral. Anyway, the imposing facade is much more modern as it was finished in the nineteenth century. The building was named National Historic-Artistic Monument in 1929. At the end of Via Laietana we arrive to the Port Vell, which means old port in Catalan. Currently this port is targeted to sport boats and it also has a commercial center in the middle known as Maremagnum, built over the sea. If you continue left you will arrive to the Barceloneta neighborhood and later on to the beach. So if you are planning to visit Barcelona this area is probably one of the most suitable ones for sightseeing itineraries, as you will be close to many of the monuments as well as to the beach. 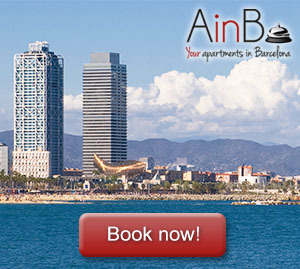 Check out our apartments for rental in Barcelona and get ready for some amazing holidays.